After the previous season’s top-five finish expectations were high among Shaymen supporters, despite the summer departure of Lee Gregory. And after six wins from their first seven games, those expectations didn’t seem out of place. However, there was never too much danger of any bloated heads at The Shay given Neil Aspin’s repeated warnings of second-season syndrome and the void left by Gregory. Millwall’s gain was indeed Town’s loss, with those 32 goals proving impossible to replace. 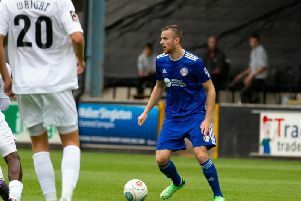 The combined efforts of Ross Dyer, Scott Boden, Danny Hattersley, Jamie Jackson, Richard Peniket and Jack Muldoon produced 35 goals, while The Shaymen scored 60 in the league compared to 85 the year before. Such shortcomings weren’t immediately obvious back in August when Town netted 14 goals in their opening six games. A heartbreaking last-ditch 2-1 loss at Bristol Rovers then preceded a battling win over Aldershot to move Town back to the summit of the table. That should have been followed by a win at Macclesfield, but Marc Roberts’ last-gasp winner was ruled out for a hotly-disputed foul. Neil Aspin was still hotly-disputing it ahead of the return fixture in April, which would see the simmering tensions between the sides boil over. A 2-0 defeat at Forest Green, against whom there was also trouble ahead, was the second of only two defeats for Town in the first two months. October heralded the first signs of the inconsistencies that would eventually prove Halifax’s undoing, with crushing defeats against Altrincham and Eastleigh. Indeed, their form had now changed drastically enough that Town won only once in November. There were disappointing losses against Woking and Welling, but plenty of honour in defeat against Bradford in the FA Cup. James Dean’s Chorley had been dispatched 5-0 in the previous round after a replay which saw the Town legend sent-off on his return to The Shay. A record home crowd of 8,042 then watched on, most of them in barely-restrained euphoria, as Lois Maynard put Town into a third-minute lead in front of the BT Sport cameras, which couldn’t keep away, televising a magnificent goal by Guiseppe Sole in Woking’s 3-1 win at The Shay a week later. But despite Town’s best efforts, a second-half comeback saw Bradford edge through; apparently they went on quite a good run after that. Two days later, another special occasion at The Shay saw England C beat Estonia under 23s 4-2, with Town’s Matt Pearson sporting the three lions on a night of real pride for the club. Town were back on track in December, with an impressive win over Worcester in the FA Trophy following a league victory over Forest Green which ended in controversy.....seconds out - round one. Both clubs were fined and warned about their future conduct after the astonishing mass brawl that broke out after that game, the like of which hadn’t been seen at The Shay for years, but would be again before the season’s end. Ding-ding, seconds out - round two. A bad-tempered 2-2 draw with Macclesfield at the start of April spilled over into a another mass scuffle involving most of the players and management staff. The rematches next season should be intersting. The year ended with a herculean effort by a group of 40 Town fans who shovelled 180 cubic metres of snow from the pitch before Halifax hosted Chester. But it was The Shaymen who were caught cold, losing 2-0. There was only one defeat in the next two months as Neil Aspin’s men started 2015 in fine style. Dartford were Town’s opponents three times in that spell, with two long journeys south yielding a hard-fought league win and a nervy 2-2 draw in the FA Trophy. Town finally hit the bullseye against The Darts with a 3-1 win at Droylsden after The Shay surface was deemed unplayable. The Butchers Arms was far from the green, green grass of home either though, begging the question of just how bad the Shay pitch was if this was regarded as a suitable alternative. The answer? Very bad, as Town would repeatedly discover. Halifax’s first game on proper home turf for a month saw them knocked out of the FA Trophy by Wrexham. But a few days layer, such trivialities were brought into shocking focus by the death of the club’s director of business development Debbie Charlton, who died in a car crash after attending Town’s 3-2 home win against Dover on February 14. In an almost ethereal moment the following Saturday, Jamie Jackson headed a late winner at home to Braintree in front of the South Stand, just yards from Debbie’s office, which had been left untouched. It would be another five-and-a-half hours until Town’s next goal as a creditable draw at Kidderminster was followed by frustrating dropped points against Southport and Dartford. In hindsight, a run of six consecutive draws then did irreparable damage to Town’s play-off hopes; points did not mean prizes. Performances weren’t the problem, with Town standing toe-to-toe against Bristol Rovers, eventual-champions Barnet and nose-to-nose with Maccesfield. But previous postponements had left Halifax, and the pitch, with a punishing schedule, with eight games crammed into March and no room for a midweek breather. A 2-1 win at Nuneaton to end the month would be Town’s last of the campaign, which petered out badly and ended with only one victory from their final 15 games. Town’s final outing at Woking did a decent job of encapsulating the campaign in 94 minutes. The Shaymen began with purpose and positivity, twice taking the lead, before gradually slipping down the gears and succumbing to a barely-believable finale of two goals in two minutes in added time. A place in the top 10 is no mean feat for a Gregory-less part-time team, but there is a sense of what might have been about a season which, for the first time under Aspin, ended with a crawl rather than a sprint to the finish.